Mr. Bettinger joined iDirect as the Director of Hardware Engineering in 1996 and acquired the responsibility of all hardware and software development as the firm’s Vice President of Engineering in 2002. The global satellite industry has been undergoing significant transformations over the past few years, paced by the blurring of lines between consumer and satellite technology. Andrew is the Director of Business Development for ORBCOMM’s Government and Maritime Services. Over the last 10+ years, Mr. Loretta has been involved in developing and implementing terrestrial- and satellite-based remote asset tracking solutions for the maritime industry, serving in Sales, Product Management, and Operations roles in support of marine-based Automatic Identification System, Long Range Identification & Tracking as well as Silent Ship Alarm Systems solutions. This year is proving to one of profound change for the world’s major satellite operators. For example, Telesat of Canada is just one of many smaller operators potentially up for sale while there are major changes in store for Intelsat, SES of Luxembourg and Eutelsat of Paris. Satellite communication systems are driven by demands for increased data rates. Many satellite communication systems operate at microwave frequencies, such as X-, Ku- and Ka-bands, which help support a wider modulation bandwidth, increase capacity, and enable the use of smaller antennas. The increase in bandwidth, coupled with high operating frequencies, creates significant challenges for RF engineers who are testing a satellite system, module or component. There’s an untapped market niche that mobile operators have not been paying enough attention to: the millions of currently unserved, potential rural customers worldwide, who clamor for cellular voice and data broadband connectivity in areas with no communication infrastructure availability. Unlike motor vehicles and aircraft, satellites do not lend themselves well to mass production manufacturing due to the specific focus of an individual satellite’s purpose. Using SkyTrac’s Satellite Technology To Track Aircraft Positions, By Brian O’Flynn, Vice President of Sales, SkyTrac Systems Ltd. Recent media focus on aircraft tracking technology underscores significant gaps in traditional approaches (radar, transponder, Automatic Dependent Surveillance-Broadcast (ADS-B), and radio communication). These technologies, or combinations of them, are typically used by the scheduled commercial air transport sector. The gaps are particularly relevant when tracking aircraft in remote areas where traditional tracking infrastructure can be limited, for instance outside radar coverage. Within its recently released Broadband Satellite Markets 12th Edition study, NSR undertook an assessment of key global trends in the interrelated satellite backhaul and trunking markets. Dr. Jason Jolliff is an oceanographer with the U.S. Naval Research Laboratory (NRL). “The emphasis here,” he said, “is on developing models of the ocean environment to help the naval warfighter.” His most recent paper, published in the March of 2014 Ocean Modeling magazine, reveals that NRL can also forecast where oil will go following a major spill. The key metrics we track for our annual Space Symposium are looking better than ever. We are sold out of exhibit space, ahead of plan in sponsorships, ahead of forecast in advance registrations and have confirmed our largest number of speakers ever. 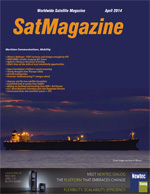 The maritime SATCOM market has seen tremendous changes over the past ten years, notably with the introduction and growth of maritime VSAT services in C- and Ku-band that allowed for higher throughput and therefore a range of new, previously unthinkable IT applications at sea.